One suspects Dallas-area developers aren’t really haunted by the ghosts of the buildings they’ve knocked down. But there’s one place in town that is: The Park and Rec’s Boneyard. And you can visit it this Friday. April is architecture month. And the among all the scheduled talks and exhibitions as part of the series, Architecture 360, perhaps the most unusual event is a tour this Friday. KERA’s Jerome Weeks reports it’s basically a visit to some high-quality, historic wreckage. They call it the ‘Boneyard.’ But that makes it sound more impressive, more spooky- gothic, than it actually is. 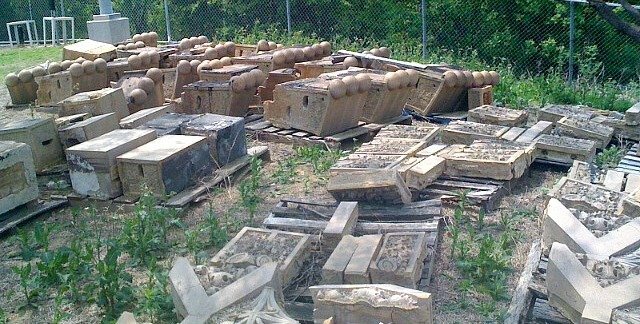 It’s just a small field cluttered with architectural salvage. It’s at the back of the Dallas Parks and Recreation Department’s maintenance center in East Dallas. And though the name makes it sound like an ancient grave site, the Boneyard has been around for only a couple years. 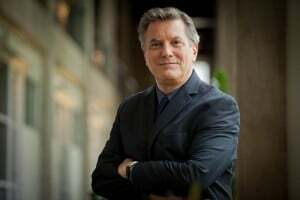 Willis Winters is the director of the Dallas Parks department (he’s also an author on Dallas-area architecture). He drives past the pre-fab sheds that make up most of the maintenance center’s 15 acres. What remains from those buildings are stacks of terracotta filigree and cast-stone curlicues. They’re the kinds of decorative additions they used to make for buildings. Now, they cost too much. Or we no longer have the skilled craftspeople needed to make them. Like the stone masons who carved the massive, 96,000 pound cartouche that used to ornament the side of the Titche-Goettinger department store, now the downtown UNT campus. All 55 pieces of that shield-like crest — bearing the ‘six flags over Texas’ on it — sit here in the sun. Elsewhere, the Boneyard has piles of bricks and light poles, even a few stadium seats. But it doesn’t have much in the way of neon signs. That’s mostly because of what our Texas hailstorms do to glass. Still, Winters would love to have more neon. One of the success stories for the Boneyard was the Parking sign on the garage torn down to make way for Main Street Garden. It was refurbished and is a highlight of the Garden today, still brightly pointing the way to stash your car. With that in mind, Winters says he’d happily accept the Alamo Plaza Hotel Courts sign that stood at Fort Worth and Sylvan Avenues. It was taken down by the Sylvan 30 developer who promised to preserve it but is figuring out what to do with it. “I’ve got some ideas for a neon park under I-45,” Winters says eagerly. The “city’s great neon signs” could be installed there and “they’d be protected” from the hail. He thinks it’d be a terrific addition to Deep Ellum’s nighttime atmosphere to have, in effect, a major, curated neon gallery right there, lighting up the dark underside of the freeway overpass. In fact, Winters says he knows a guy in Lewisville with a lot of old neon. But it’d have to be restored. And with the cost of restoring broken neon signs, Winters admits the whole thing is a project that’ll have to wait for a major donor. Some items in the Boneyard come with mysteries attached – like relics from a shipwreck. A few years ago, Winters got a call asking him to come out and look at something. He points to a pair of intricate, ornamental longhorn skulls (above) and what look like cornices with the entwined initials DAC. The Dallas Architecture Club stood at the corner of Pacific and Live Oak until it was torn down in 1978. It’s not known how these items got from there to where the contractor unearthed them – in the elephant holding pen at the Dallas Zoo. Then there’s what Winters calls “Area 52.” It’s a nearby shed. Last year, a car damaged a lamp post in Dealey Plaza, and Winters was asked to save the fixture. That’s because no one knows precisely what happened to the first bullet Lee Harvey Oswald fired from the Texas School Book Depository. 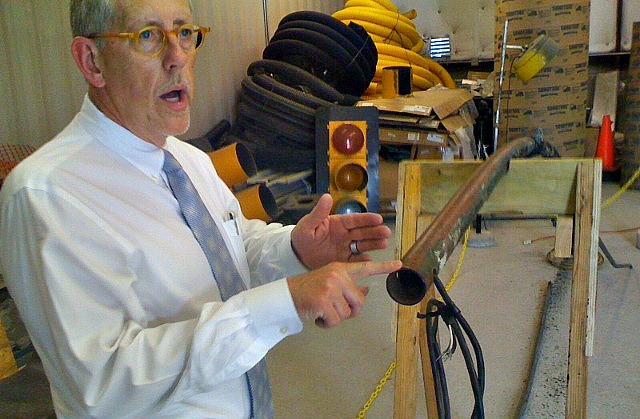 But JFK assassination investigator Max Holland has argued in a National Geographic cable special (JFK: The Lost Bullet) that the bullet ricocheted off this lamp post. So forensic experts have been going over it inch by inch. Wandering through the Boneyard, one can’t help thinking many of the pieces look … abandoned. It’s true American cities are always re-inventing themselves. But for decades, Dallas has used the bulldozer without much restraint; entire historic neighborhoods have fallen, developers have torn down buildings in the middle of the night to avoid any preservation hassles and the city fines they risked were a minor annoyance. Winters says even now it sometimes happens that he’s arranged a deal with a developer to save something. Then he finds that, for some reason, the wrecking ball couldn’t wait. But if Winters could save such architectural fragments, what could he save them for — other than baking in the sun in this secluded field? Join us in April for Architecture360—a month full of public events celebrating architecture and design in our great city—from exhibitions and celebrations to tours and panel discussions, presented by a wide range of organizations and partners and sponsored by AIA Dallas and the Dallas Center for Architecture. Visit dallasarchitecture360.org for a full calendar of events. Dallas Parks & Recreation Director Willis Winters will lead a tour of the Architectural Bone Yard, aka “Area 52” located in the maintenance yard in East Dallas. 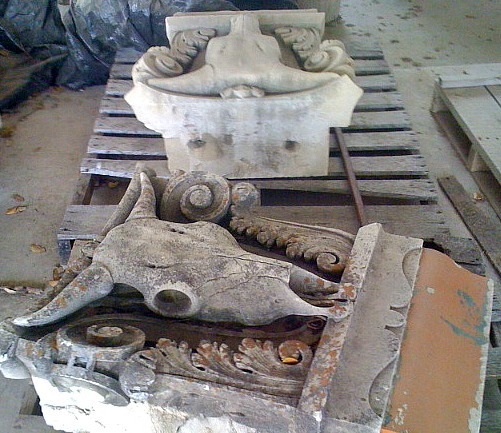 The bone yard is the final resting place of some notable architectural fragments salvaged from Dallas buildings during demolition. The collection include the cast stone pieces from the 1922 Dallas Architectural Club, the gold rings from the Gold Ring Parking Garage, and the entire limestone cartouche from the Titche’s downtown store. How neat it would be to see these artifacts used in the Dallas Design District. This is great stuff! Has Parks & Rec thought about offering these items for sale/auction? We are looking for circa old 5 panel doors – do you have any?